The Moderators Circle is a group of dedicated individual who contribute monthly to MCC. Their monthly gifts create a reliable source of funding year round, as well as helping reduce our costs. This allows MCC to spread or mission of love, hope and acceptance. 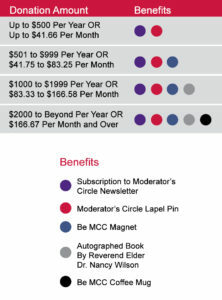 As a monthly donor, you will be welcomed into the Moderator’s Circle and receive information and updates from our Moderator, as well as the benefits listed below. Your gift will be charged automatically each month and your monthly gift can be modified at any time. 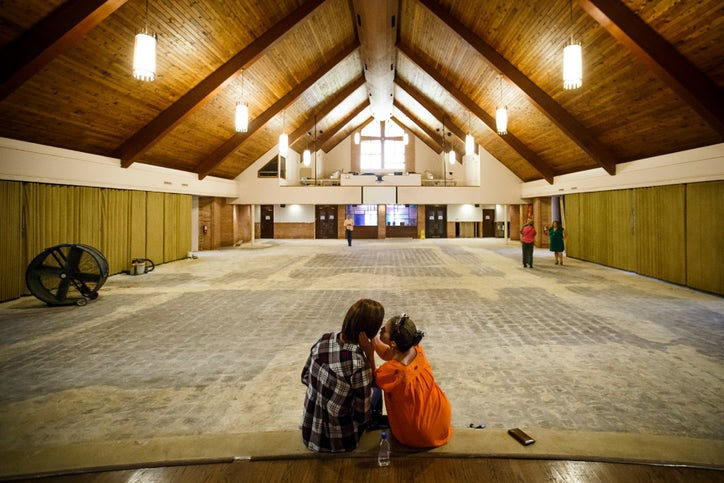 Resurrection MCC, Houston, Texas, has received so much care from volunteers within the church and the wider Houston community to help in stripping out damaged floors, walls, and furnishings after nearly two feet of water filled the sanctuary, children’s rooms, offices, fellowship room, bookstore, bathrooms, and hallways. Rev. Troy Treash is reporting that the church is meeting with two worship services in the gym on the property. The ministry to the community continues with the thrift shop and food pantry in high demand. He added that a congregant is assisting in paying the insurance deductible! Many people are recovering from personal losses due to flooding, adapting, and still serving faithfully. The long work of recovery is still ahead and assistance will be needed for the next phases. of water in the building. Read the full article: https://bit.ly/2xBOCnj. In Puerto Rico, Cuba, Florida, Georgia, and South Carolina, so many churches, leaders, and congregants are still feeling the impact of Hurricane Irma. Some are reporting minor damage to homes and property. We are blessed to report that the damage is not as bad as we initially feared. All of the MCC church buildings are without significant damage. Even in the Florida Keys, Rev. Steve Torrence said the MCC Key West building was untouched somehow. Deacon Wanda at St. John the Apostle MCC in Ft. Myers, Florida, praises God for no damage to the church and will host a prayer gathering in the church parking lot on Sunday since the electricity is still out. Natural disasters continue in other locations. Powerful typhoons loom in the East and South China Seas; a strong earthquake rocked Mexico City last week followed by the threat of Hurricane Max this week; and wildfires with heavy smoke and ash continue to impact the U.S. Pacific Northwest in Oregon and Washington State. People have been calling on one another, sending texts, and checking in on those with medical needs. Together, we have been a community. As many continue to suffer in the impact of these natural disasters, their stories vary. Some are without electricity, others are beginning the journey home following an evacuation, and many are clearing debris and making repairs. These weeks have had a deep emotional, physical, mental, and spiritual impact. ….for electricity to return. MCC Churches and people just recovering from Hurricane Irma are longing to gather, sing, and worship together. Today, many cannot read this message because they do not have electricity or access to the Internet. ….for safety in the long weeks and months of recovery. May we be protected and strengthened by the angels around us and the restoration of the Holy Spirit. ….for strength those who continue to battle a fires, floods, storms, and other natural disasters. ….for those grieving losses of safety, security, housing, jobs, and life. ….for the pastors who have been up for hours praying for those afraid, assisting in discernment whether to evacuate, checking on the people of the church during and after the storm; may they find rest and renewal for the recovery effort. Churches and generous persons such as yourself are a lifeline to the ministries of MCC. Please go to MCC’s website to locate a church impacted by the recent hurricanes and give directly to their website. This is the time to give $50, $500, $1,000 or more. Your gift will make a difference. We are committed to equipping ourselves and each other to do the work that God calls us to do in the world. Especially in times of storm, loss, and uncertainty, we are reminded that our commitment to community is more than an ideal, it is a way of life.